14/20 Gold Filled 17.2x33.6mm 21 gauge V-Wire Earring Findings, 1.7mm Open Ring ID. 10pc pack is the equivalent of 5 pairs. V-Formation. With migrating birds, it improves flight efficiency. With the Military, it’s commonly used in ceremonial flyovers. In American football, it was banned for safety reasons. Bottom Line: It works! 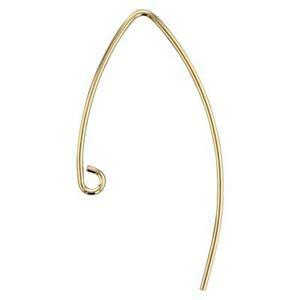 And you’ll love the way our 14/20 Yellow Gold-Filled 20 Gauge V-Wire with a 1.5mm Inside Diameter Open Ring will work for your earring designs. Put flight to your fancy. These hooks are great. I find them very elegant.